676 Restaurant & Bar has one of the best views overlooking the Magnificent Mile. I see this restaurant as a hidden gem that focuses on locally grown vegetables, locally sourced meats, and homemade everything else. Unfortunately, the food can either be amazing or very disappointing. I have honestly had some of my favorite appetizers at this restaurant, but I have also experienced some entrees that I would never want again. It is a great classy atmosphere and a great place for larger groups to come and enjoy a nice meal but use this entry to stay away from some of their dining options! I thought the Coppa with the corn relish was the best. But everyone thought differently. Some loved the chorizo enough to eat it plain and others couldn't get enough of the cold smoked salmon. All of the spreads pair extremely well with the meats. 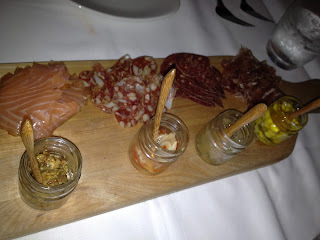 Definitely try the charcuterie and I would recommend any of the ones we had! The flatbreads at 676 are by far the best appetizers you can order. They have amazing flavors, they are huge portions (great for sharing), and are so unique they make the meal memorable. 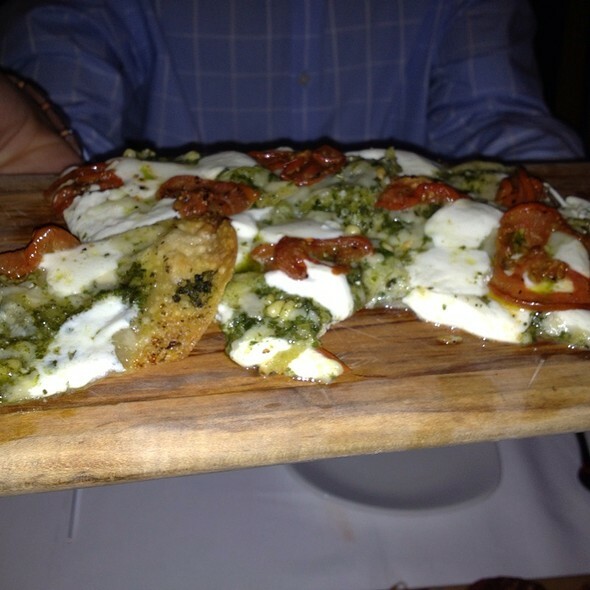 This particular flatbread had a homemade basil pesto, in-house oven-dried tomatoes, and hand-rolled mozzarella cheese. You can honestly taste the freshness with every bite. It is much stronger flavored than a typical Margherita pizza and in my opinion is 20x better. The flatbread crust is just thick enough to support all the toppings, but not too thick to fill you up before your entree comes. A must order! Another AMAZING flatbread! 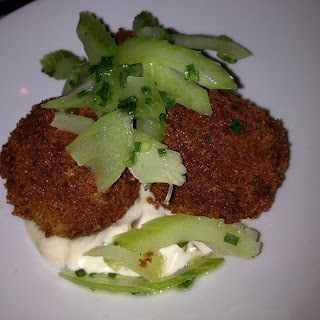 I loved this appetizer and, like the previous one, I thought it was excellent size to share with a larger group of friends or even a small family. 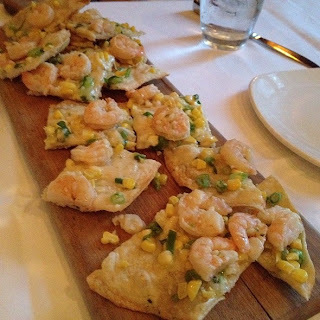 The flatbread comes with easily a dozen pieces each with two or three perfectly cooked shrimp, an herbed cream cheese, and a scampi sauce. The flavors complimented each other so well. I honestly could have eaten this for my meal and sometimes wished I did. Honestly, WOW is how I can describe it! 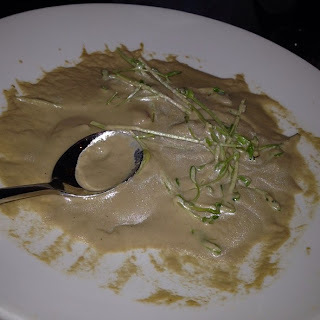 This is a glorified cream of mushroom soup. It is extremely creamy and surprisingly the mushroom flavor is extremely strong. When I first saw it, I thought the cream would overpower the mushroom, but it doesn't and its just perfect! These fried cakes are made walleye and crab and basically that is all. There is not much filler except for the fine bread crumb breading that surrounds the cake. Pairing this with one of the soups or maybe one of the salads would a perfect size for a meal. It was served with a lemon aioli and a celery based slaw. The slaw wasn't very pleasing to eat in my opinion, but the seafood cakes were perfectly crisp on the outside and extremely moist inside. 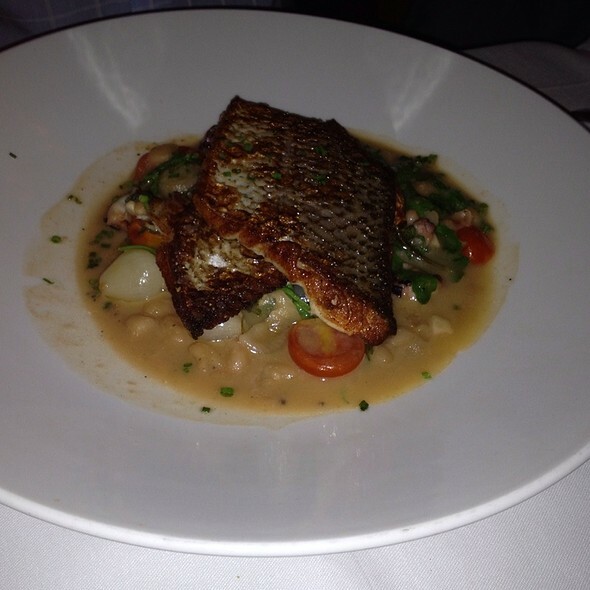 I have had the white fish during a previous dining experience at 676 and this time my little brother ordered it. Two pieces of white fish are first seared skin side down to get an that amazing textural component of a crispy skin. It was served on top of a white bean/potato puree with a little sautéed arugula and tomatoes. I always enjoy this dish... today it was a little too fishy for some reason and the so called heirloom tomatoes weren't as refreshing as I have had in the past. I was wondering if maybe they didn't update their menu description. 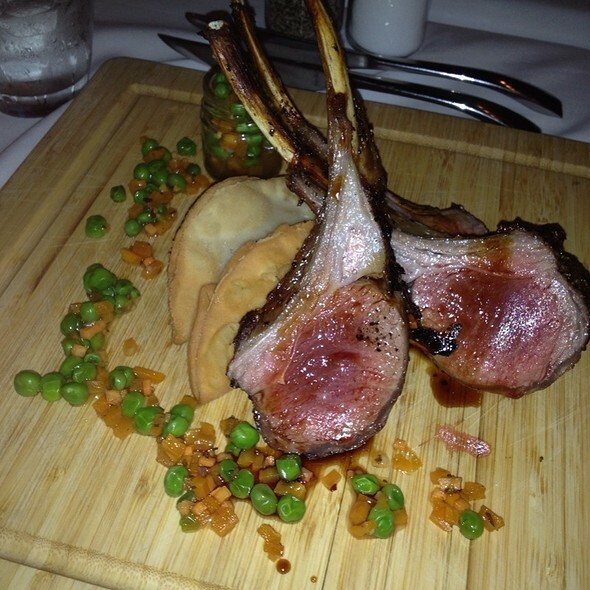 This entree was lamb 3 ways. I was surprised how large the plate was. Three medium rare cooked lamb chops were sitting around lamb belly and lamb shoulder empanadas and a lamb hot link. The hot link was nicely spiced and the empanadas were loved by everyone. I had to make sure I kept half of one for myself while the others tried splitting the other one and a half. But one complaint with the empanada was the unflavored crust. It was like eating a thin fry-bread crust with an oily flavor. Now for the chops, they had a nice spice crust. They were cooked to a medium rare but for some reason were still a little tougher than I was expecting. The entire meal was served with a peas and carrot spread. Another entree with the meat being prepared 3 ways. My brother chose this cutting board that came with a huge pork chop, a nice chunk of sautéed pork belly, and of course a homemade pork sausage. 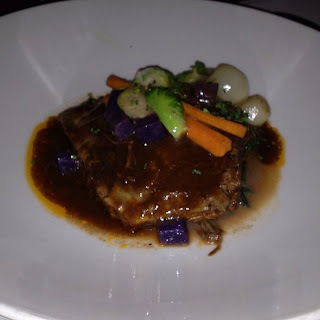 Unfortunately, everything, in my opinion, was too bland and too fatty The pork chop, probably in attempt to keep it moist, had a lot of fat left on it and of course the pork belly always has lots of fat. The pork belly was delicious but when eating it all together I couldn't tell the difference between the preparations and with fried potato chips, there was too much grease. This entree definitely needs to be shared. This entree reminded everyone of your mom's pot roast. A huge chunk of angus beef that has been made extremely tender and stewed in a delicious brown sauce. The beef pulled apart into strings and seemed to melt in your mouth. It was served with pearl onions, a couple slivers of carrot, and what seemed to be chopped chard. I also think they it came with chopped purple potatoes for a starch. I was a little disappointed with the overall concept of this dish. It was nothing special and was served extremely simple. There was not enough starch and the gravy was almost too rich to not have a starch. It would be much better with a nice smashed potatoes or some wild rice. 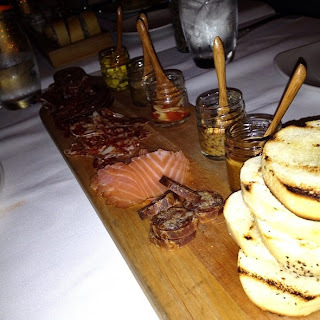 - I think the Flatbreads and the Charcuterie Plate are MUST HAVES! These dishes are recommend highly and I think everyone would be disappointed if they let this restaurant without enjoying them. - I would suggest sharing a bunch of the items... 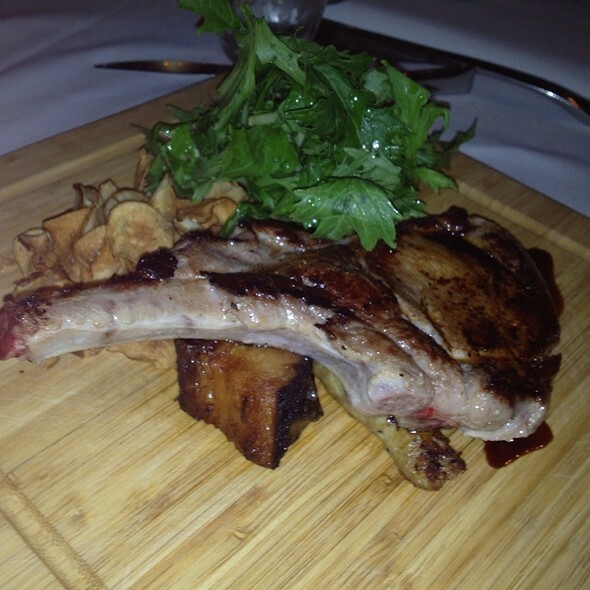 They are huge portions and every two people could share an appetizer and an entree and be extremely full. - Do come here if you have no where else to go... It is not extremely popular these days so reservations aren't that difficult to come by. - Don't drive here... there is no parking around the Mag Mile and I think it is better to just walk/public transport/taxi it here and not worry about paying for parking or wondering when your parking will expire.